When house-shopping in Kingston NY, here's a list of places to grab a bite in the Midtown Kingston NY Arts District. Thanks to the burgeoning film and tech industries moving up from nearby New York City, Kingston's midtown has been undergoing a renaissance and is currently being re-branded as the Kingston Arts District. This centrally located neighborhood geographically unites historic Uptown Kingston with the waterfront neighborhood of the Rondout. The Arts District has an emerging foodie scene spearheaded by PAKT and Peace Nation Cafe along with more traditional and established venues such as The Anchor and Frank Guido’s Little Italy. 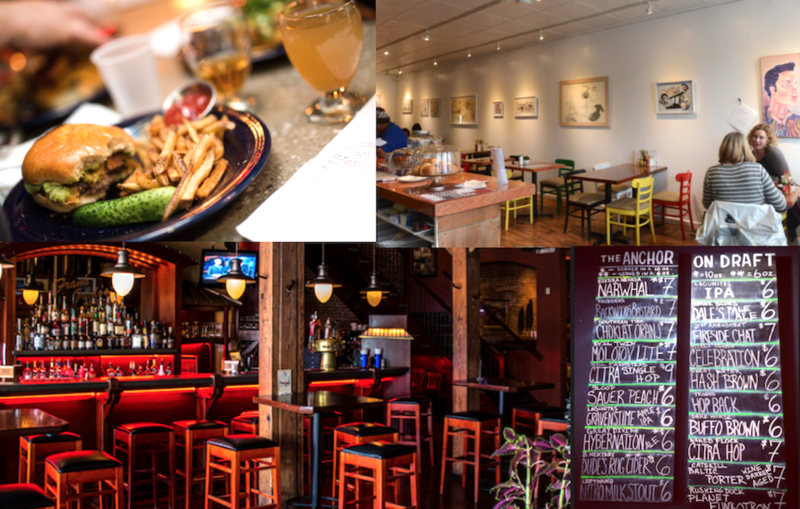 PAKT specializes in Southern Food such as fried green tomatoes and catfish sandwiches while Peace Nation Cafe offers an authentic Latin menu with plenty of vegetarian and vegan variations. For amazing burgers every which way, and over 20 craft brew beers, head over to The Anchor. The Anchor also has live music and a vibrant night life scene as well as serving as late as 1 AM on weekends. Frank Guido’s Little Italy is famous for its family-style dining of delicious Italian specialties. And be sure to head there on your birthday when Frank Guido will comp your dinner up to 25.00! Visit our other posts about eating out the Uptown and Roundout on the Waterfront of Kingston, NY! No matter what you like to eat, make the drive to Kingston, NY and enjoy the latest in gourmet variety, traditional specialties or ethnic cuisine.